Using a hotel could make your visit very pleasant and SAVE YOU MONEY ?? Because FREE PARKING is plentiful in the area on single yellow lines and parking bays after 13:00 on Saturday and all day Sunday. 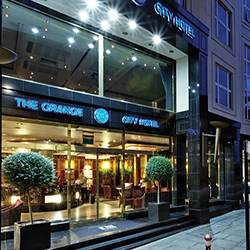 As taxis are very expensive you may well find it cheaper to travel by tube or car to a hotel in the day – providing you a relaxed, luxurious changing place, with no worries about, taxis or drinking and driving. The WayOut Club is surrounded by good quality and good value hotels. Prices range from £70 to £200, (depending on tourist season). Ask for the “best weekend rate” and try to book well ahead (Online prices are often best). 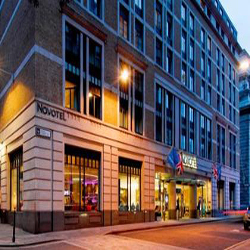 These hotels are all just a few minutes walk from Tower Hill and Aldgate tube station and Tower Gateway DLR (Docklands Light Railway) and Fenchurch stations. London City Airport is just a 5 mile drive away or accessible by the DLR (Docklands Light Railway). 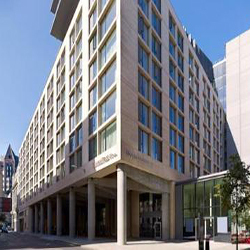 These hotels are located in London’s financial district. On Saturdays it is usually possible to get a MUCH cheaper weekend rate as the City businessmen go home on Fridays. However since the 2012 Olympics the area has become more popular with tourists having many hotels at good rates and being close to some of London’s top attractions including The Tower of London, Tower Bridge, St Paul’s Cathedral, Tate Modern art gallery, the Southbank complex and over 200 shops and restaurants at nearby Canary Wharf which is just a DLR (Docklands Light Railway) trip away from Tower Gateway. The WayOut Club is in the congestion charging zone but there is NO CHARGE on both Saturday and Sunday. 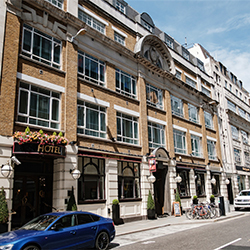 This hotel is right next to our venue at The Minories. Some have booked for as little as £26 by booking well ahead on line. Some go back to the hotel to change outfit a few times during the night. VERY safe short walk to and from the club. 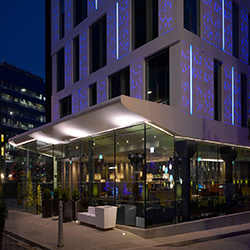 This is our HOTTEST tip – This is the latest brand new hotel to pop up near the WayOut club it is opposite Indigo and The Chamberlain and is offering sub £100 prices on the window. Free WiFi andy very modern rooms to a european standard. No need for taxis and very safe short walk to and from the club.. This is has been our recommended hotel for many years. 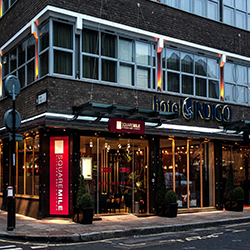 It is in Minories only a short walk away the WayOut Club’ at The Minories. (prices vary wildly depending on the tourist season). 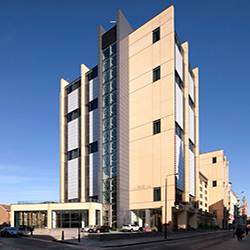 This is possibly the cheapest hotel in the area and very close to our venues. 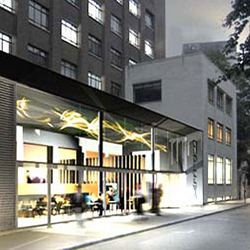 Walkable to the club at The Minories (but maybe – in heels – a cheap taxi ride away – about £10.00). 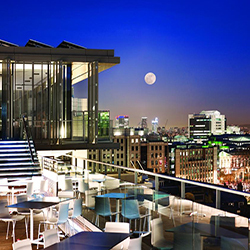 It has the most astounding views from its Skylounge cocktail bar and restaurant. For the cost of an expensive drink it is well worth visiting and if dressed appropriately it is welcoming. Some of our regular girls make a visit between 21:00 and 22:30 on the way to the club. In addition to the many usual rooms – this hotel has a few rooms without natural light in the basement. If you specifically ask for one these you can expect a discounted rate to usual rates. This hotel is very close but is the busiest tourist hotel and we have not had many visitors stay here compared with the others close by. 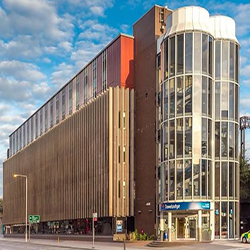 Close to the Chamberlain Hotel and opposite Motel One – this boutique hotel offers loads of extras including an on-site fitness suite, which is free to guests, all at suprisingly reasonable price. WayOut visitors have highly rated this hotel. You can ask for views that overlook Tower Bridge offering amazing value from most rooms at surprisingly good rates. A favourite for some of our guests. Very new and very friendly this hotel provides luxury accommodation making it a great choice for your stay. With advertised prices as low as £90. 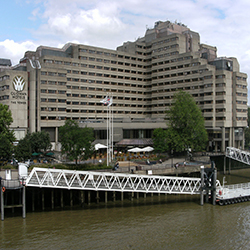 Opposite Grange Tower Bridge Hotel – Easily walkable to the club but I haven’t heard of anyone stay here ?? 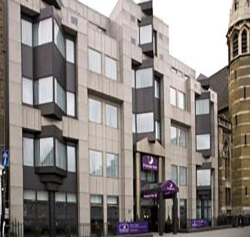 Premier Inn of course has everything you’d expect, incredibly comfy beds in every room and an integrated restaurant serving a mix of traditional and contemporary dishes.